(TibetanReview.net, Nov03, 2016) – Tibet’s exiled spiritual leader, the Dalai Lama, has on Nov 2 expressed confidence that he will live to be more than a hundred years old. The occasion was a long-life prayer offering made to him by the Phenpo and Pemakoe Tibetan communities at the Tsuglakhang, Dharamshala. “As I have told before, there have been certain revelations that I will live for more than a hundred years. Personally, I also pray and hope to live for the next twenty years or more to continue to serve the well being of all sentient beings,” he was quoted as having told a gathering of thousands of Tibetans and other devotees who witnessed the ceremony to pray for his long life. The Dalai Lama has expressed confidence that the prayers would be seen fulfilled. 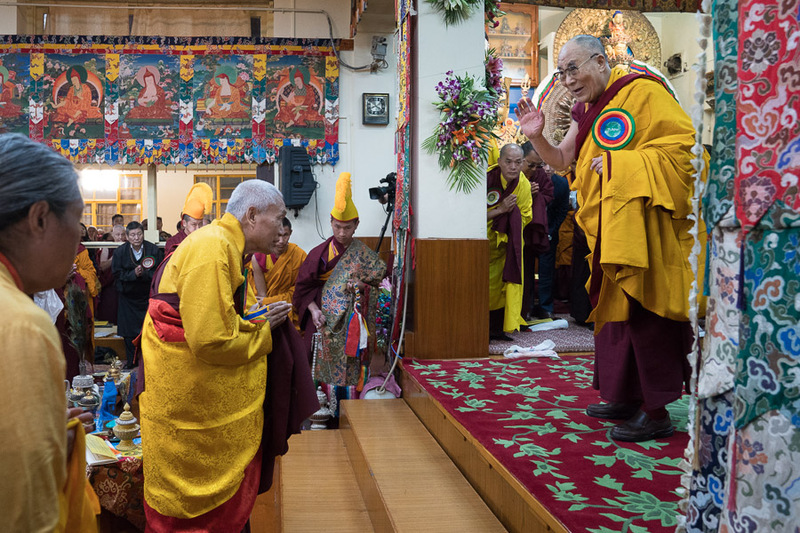 From his part, the Dalai Lama has urged his followers to be true followers of the Buddha, focusing on the quality of their religious education and practices. “The main purpose of the Buddhist teaching is to train and conquer one’s mind. By doing that, one will be able to achieve peaceful mind and body and simultaneously spread peace in your environment,” he was quoted as saying. Turning to the people from Pemakoe, the Dalai Lama said the place had a special relevance as the birthplace of the late Dudjom Rinpoche, one of the most renowned Tibetan yogis and a supreme leader of the Nyingma lineage of Tibetan Buddhism who had made invaluable contributions towards Tibetan culture, religion and literature.